I am not one for resolutions, but I do like goals. This year I wanted to set a few realistic ones so I sat down after the 1st and thought about what I’d really like to accomplish. Here we go. 1. Put full effort into querying The Strongest Chain (formerly the Davies). I’ve been tentative in the past and now I feel ready to successfully shop it around. I just gotta do it. 3. Revise Bittersweet. This was my last NaNoWriMo novel and I love the characters, the setting, but the plot was – meh. I’m taking my newly-acquired structure and pacing skills and trying to save it from the reject drawer. Bittersweet is set in a small town amongst the mountains of Maine. The main characters are a hoot because they’re both middle-aged and stubborn. They were fun to write and I want them to see the light of day. 4. Plot out the sequel to The Strongest Chain. I have some ideas and I need to make sure they don’t get lost in the ether while I’m busy with other things. 5. ROCK MY DAY JOB! This needs caps because I’m worried my competing interests will shave off some of my determination to do the best job possible since doing an okay job is always (unfortunately) an option. I don’t want to just do an okay job. I want to rock it! 6. Shout less at my kids. I noticed this year how loud my family is and I realized that part of the reason for the shoutyness is how often it starts with me. My office doesn’t have a door and too often I’m wrapped up in editing or writing and my munchkins come in mid-fight about Mario Smash Bros or something else that doesn’t make my list of stuff to care about and when they don’t respond to my quiet re-directions I raise my voice. I’d like to find another way to get through to them that doesn’t include cranking the volume to eleven. 7. Clean my office. And the rest of my house. It’s another thing that I let slide in order to fit writing in amongst working full time and parenting full time. I need to be the lead on this since no one else in my family has the clean gene and there are five of us in a tiny (albeit cool) converted barn with no garage, no basement, no closets, no attic. It’s really open which is great, but not so advantageous for the storage of stuff or the hiding of clutter. Visible clutter oppresses my spirit so I want to see if we can fix that. 8. Read more of the good stuff. Including the bible. I’m lazy about reading the books that do more than just entertain. I’ve got a stack of the good stuff waiting, I just need to get on it! Totally doable right? I’m looking forward to whatever this year brings and to doing the deeds! 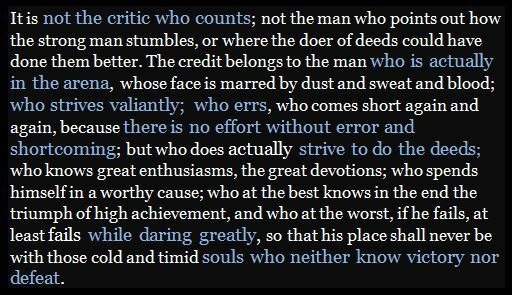 – see inspirational quote from Theodore Roosevelt below. I loved this because its just so real.